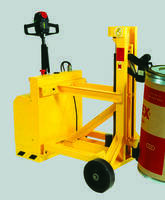 The Liftomatic’s C1D1-DCM Drum Transporter is equipped with electrically enclosed and spark-free power drive. The unit provides standard lift height of 20 in. that allows for palletizing spill pallets. It is offered in fully counterbalanced configuration for head-on work with pallets and cabinets. This transporter comes with Parrot-Beak® clamping system and is designed for lifting, lowering and moving types of steel, plastic and fiber drums. Buffalo Grove, IL, Liftomatic Material Handling, Inc., an industry leading material handling equipment manufacturer, recently introduced a customized portable drum handler for C1 D1 applications, the C1D1-DCM. 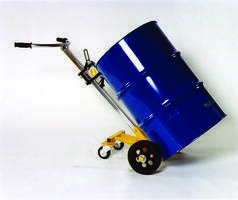 The C1D1-DCM power drum transporter is a completely powered and self-contained handling device for lifting, lowering and moving all types of steel, plastic and fiber drums. The unit incorporates a completely electrically enclosed and spark-free power drive, as well as power lift and lower for moving drums quickly and efficiently by any operator in all plants, warehouses and laboratories. Weight capacities up to 1000 pounds are available. The models offer users a number of benefits, including protection for “EE” and “EX” rated environments. Features include a steering/throttle handle for forward/reverse drive, lift and lower features and tight turning radius for tight aisle and restricted workspace facilities. The transporter offers a standard lift height of 20” to allow for palletizing on standard or spill pallets and handles up to 1000# per drum. The power system can negotiate inclines and offers the ability to load/unload trucks and shipping containers. Additional features include a fully counterbalanced configuration for “head-on” work with pallets, cabinets, etc., and heavy-duty deep-cycle industrial grade battery. 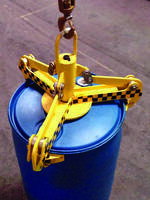 The C1D1-DCM uses Liftomatic’s proven “Parrot-Beak®” clamping system for safe handling of steel, plastic and fiber drums. An optional charger is available. 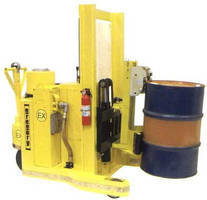 Liftomatic Material Handling, Inc. is an acknowledged leader in the design and manufacture of drum handling equipment. Headquartered in Buffalo Grove, Illinois, Liftomatic maintains manufacturing, engineering and sales facilities around the globe. Liftomatic currently sells products in over 40 countries and sells to more than 400 of the Fortune 500 companies. For more information, please contact: Liftomatic Material Handling, Inc., 700 Dartmouth Lane, Buffalo Grove, IL 60089, Sales Dept. 847-325-2930 Web: www.liftomatic.com Email: info@liftomatic.com.